This sounds incredibly interesting and useful. But if I register, will the talks be available for streaming on demand later? I live in a different time zone, so the time is not exactly optimal for me. Those clicking on the link: the discounted price is shown even before you submit the form with the promotional code. The discounted price is $125.10 for individuals. The regular price is $139.00. Karen, it’s an online conference. All you need the day of the event is a modern browser, a good Internet connection. If you have any other questions in the meantime, please don’t hesitate to ask. Arne, the Summit Series is geared to delivering the best live experience we can. To get the most out of it, it’s best to attend “in person”. I don’t understand the difference between Individual and Meeting Room. I can’t seem to find the explanation of the difference. What am I missing? 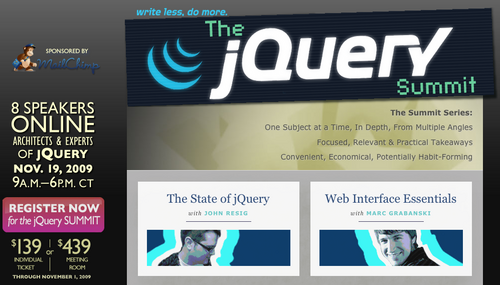 An Individual ticket is for one person viewing the jQuery Summit. The Meeting Room ticket is an onsite license ticket for businesses or organizations that want to broadcast the CSS Summit on their own projection screens in meeting rooms or auditoriums. uhm, did somebody managed to upload the much awaited videos from the previous conference? I’ve been wondering how much I’ve missed since then.